Nov. 2nd, we have moved to new location: 4001 Medical Pkwy. It was really sad to leave our old location, great neighborhood. But we were overwhelmed by numbers of customers who came all the way from our old location. At this new location, finally we got enough space for outdoor seating. There are 3 picnic tables. 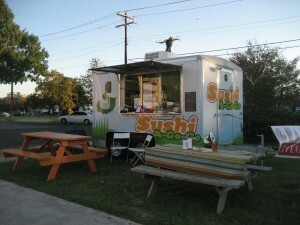 Especially, it is the best season to be out and enjoy this great weather, please come and try our sushi rolls soon!